The Canon imagePROGRAF iPF815 MFP M40 is a large format imaging system that is designed to be a complete Scan-to-Copy, File, Share Cloud solution. The system includes an imagePROGRAF iPF815 large format printer, M40 large format scanner, MFP stand, computer, SmartWorks MFP Software and a large touch-screen monitor.† This solution provides a fast and effective system for printing, copying, archiving and distributing maps, drawings, renderings, site and facilities management plans, design and layout proofs, posters and more. This Multi-Function Product’s advanced M40 scanner adds versatility to the product capabilities with the ability to scan documents up to 2mm thick, allowing users to scan more than just technical documents. The SmartWorks MFP software simplifies the entire Scan-to-Copy, File, Share Cloud process for users of all experience levels. The iPF815 MFP M40 also includes Canon’s Direct Print & Share, a cloud-portal software solution that enables the viewing, sharing and printing of files from anywhere in the world, and allows you to store up to 5GB of free storage through your Google account.††The versatile Canon imagePROGRAF iPF815 44-inch large format 5-color printer is designed for use by professionals in a variety of different markets including Computer-Aided Design (CAD); Architecture, Engineering, and Construction (AEC); Geographical Information System (GIS) and other technical document professional areas to produce large technical documents or posters in color. 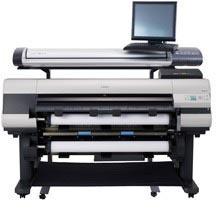 The included software utilities can be used in a variety of industries and applications such as in the retail signage industry as well as general office environments.The iPF815 MFP M40 provides the versatility and flexibility needed to be used in a wide variety of industries and applications, all in one captivating package.